The story: The ten-year-old boy had no memory of his parents or even his real name. Faced with abuse, he ran away from the orphanage and lived on the streets with other homeless children. His new life began when he was caught stealing food from the “Star People” — visitors from another world. He is eventually adopted by one of the Star Men, and after several adventures, he leaves his world with his new dad to explore other planets, where beauty and danger await! 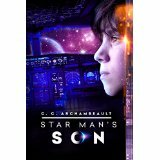 Star Man's Son, the first book in the Star Man's Son series. It is a science fiction adventure story geared to readers age 9 and up. It includes solid science, good grammar, and promotes good character.